Vanadium Analysis Cartridge | OndaVia, Inc. 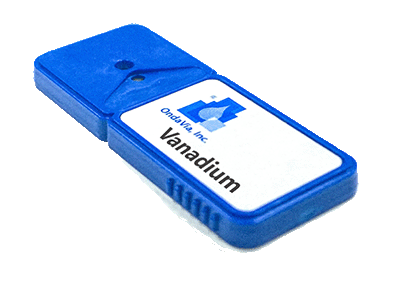 The OndaVia Vanadium Analysis Cartridge offers ppm-level measurements of vanadium in water samples. Vanadium is a naturally occurring transition metal found in fossil fuels. In diesel fuel, trace vanadium is the primary component responsible for high temperature corrosion. All forms of vanadium should be considered toxic. Our analysis kit measures vanadium in aqueous samples as vanadate, requiring an oxidation step to convert all vanadium into the +5 oxidation state.